Working for a long time in any one place creates a real risk of acquiring myopic view of the world; you start making assumptions that the rest of the world is similar to your own place of work- the same systems, processes, constraints and so on. I’ve been working on Wi-Fi at the University of Exeter for a good 5 years now and although I do touch base with peers at other institutions it struck me that I didn’t really know what major challenges the networking guys at other institutions faced, or what kind of Wi-Fi stuff they had going on. The survey received 40 responses, gathered primarily from folks who subscribe to either the UCISA-NG mailing list or the JISC wireless-admin mailing list, plus a few who attended the UK Networkshop43 at Exeter, where the survey was ‘launched’. The results of this survey are free for public consumption [under the creative commons license] and linked to at the footer of this post both as summary and as a raw data csv. If you’re really interested, then no doubt you’ll take a look at the results for yourself, but I’ll be looking to add more details and analysis in future blog blog posts; you can look out for them on Twitter (@ukeljay). This post is going to be the first of a few which will explore in some detail the results, alongside my musings about what they might mean. I’d be very interested to hear from anyone who has a view on the results, or any Stats Wizards who fancy digging deeper into the data. A Starting Point:- How important are Wireless Networks to UK Universities? Perhaps this is a bit of a no-brainer, but represents a good place to start. One of the first questions I asked was simply how important it the WLAN to your institution? No real surprises here! 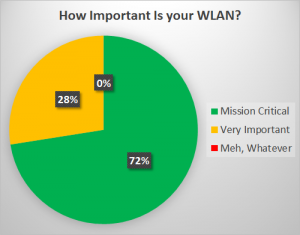 Nearly 3 in every 4 respondents rated their WLAN as critical to the functioning of their institution, with the rest suggesting it was ‘very important’. Perhaps no surprise when we consider that I was surveying the people who are paid to keep the stuff working, but it may be worth thinking a little deeper. The second option was Very important – but we’d survive without it., implying that Mission Critical really means that the institution could not do business without their WLAN. Either way, given that nobody rated their WLAN as ‘nice-to-have’ or ‘Wi-Fi? Whatever!’, from the point of view of the WLAN administrator, a functioning WLAN is pretty critical to the functioning of a modern University. The Network Managers – who’s keeping the [blinky] lights on? I was also interested to find out who it is who operates these academic Wi-Fi networks? Who keeps those little lights a-blinking? Are UK Universities awash with cash; armies of Wi-Fi minions sitting waiting for an AP to go down in order to rush out and repair it? 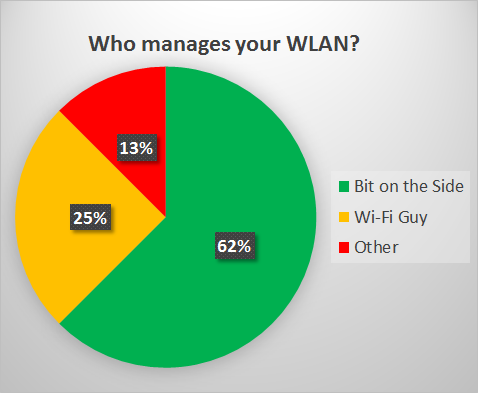 Nearly two thirds of respondents indicate that their WLAN is managed by individuals who’s primary responsibility is keeping the LAN (or soemthing else?!) running, with only 1 in 4 suggesting that an individual is employed full time to keep the WLAN working. No respondents have indicated that they are part of a dedicated WLAN team. There is much more to be said on this topic and much more survey data to be analysed, but already I do wonder whether UK HE WLANs have the resources levels required to meet the expectations placed upon them. As thanks to those who were willing to work through quite a lengthy survey, LEVER Technology Group PLC in Leeds kindly donated a place on the CWNP’s ‘CWNA’ course for one individual survey respondent. So, well done and thank you to Simon Palmer, winner of the place on the CWNA course, hosted by LEVER. You are very lucky indeed to have dedicated WiFi resource at your Uni Campus. I work for sys integrator and time and time again we come across facilities that deploy huge wifi networks but with nobody with any real understanding how any of it works supporting it, relying mainly on “auto RF” features. Its reflected in the healthcare sector too, but then you would expect this to be the case. Both of these types of organisations claim that they can not afford to hire dedicated wifi engineers. I wonder at what point wifi becomes so critical that they have to hire wifi engineers?